Submitted photo Mike and Fran DeWine enjoy the first event of the Inaugural weekend — Celebration of Ohio’s Future Leaders and Innovators hosted by Lt. Governor Jon Husted. Submitted photo Fran DeWine, Mike DeWine, Jon Husted, and Tina Husted welcome a room of Ohio’s future leaders and innovators. 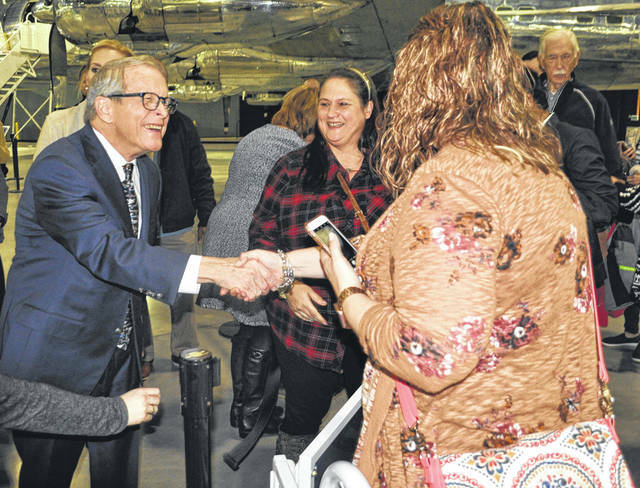 Scott Halasz | Greene County News Mike DeWine speaks to the media during an inaugural event at the Science, Discovery and Family Fun event at the National Museum of the United States Air Force. Scott Halasz | Greene County News Fran DeWine answers a question as her husband, Mike, looks on. Scott Halasz | Greene County News Mike DeWine is interviewed by the Air Force. Scott Halasz | Greene County News Mike DeWine speaks with Maj. Gen. William T. Cooley, commander of the Air Force Research Laboratory at Wright-Patterson Air Force Base. Scott Halasz | Greene County News Mike and Fran DeWine receive a box of popcorn from a local scout. 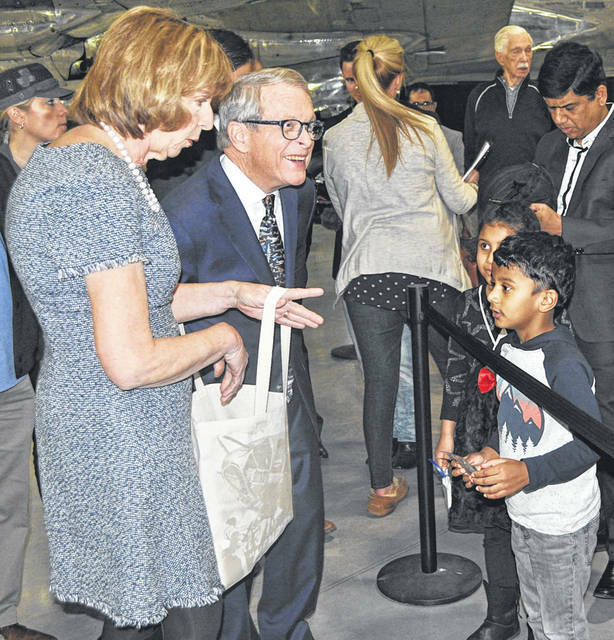 Scott Halasz | Greene County News Mike and Fran DeWine pass out airplane-shaped chocolates to those in attendance at the National Museum of the United States Air Force. Scott Halasz | Greene County News Mike DeWine greets some attendees. Mike and Fran DeWine enjoy the first event of the Inaugural weekend — Celebration of Ohio’s Future Leaders and Innovators hosted by Lt. Governor Jon Husted. Fran DeWine, Mike DeWine, Jon Husted, and Tina Husted welcome a room of Ohio’s future leaders and innovators. Mike DeWine speaks to the media during an inaugural event at the Science, Discovery and Family Fun event at the National Museum of the United States Air Force. Fran DeWine answers a question as her husband, Mike, looks on. 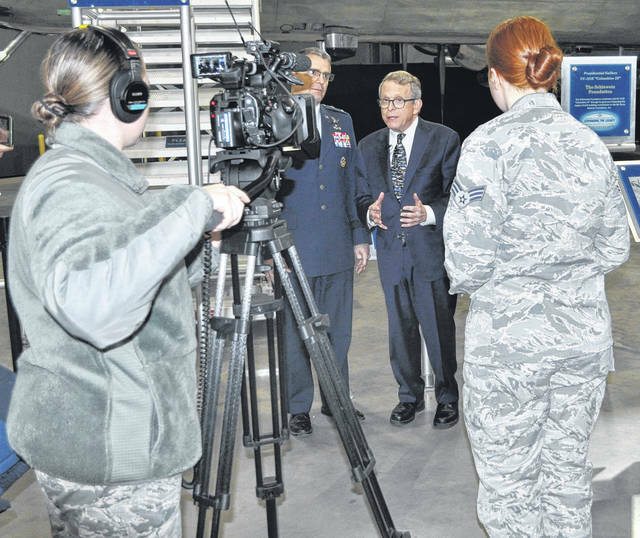 Mike DeWine is interviewed by the Air Force. Mike DeWine speaks with Maj. Gen. William T. Cooley, commander of the Air Force Research Laboratory at Wright-Patterson Air Force Base. Mike and Fran DeWine receive a box of popcorn from a local scout. Mike and Fran DeWine pass out airplane-shaped chocolates to those in attendance at the National Museum of the United States Air Force. Mike DeWine greets some attendees. 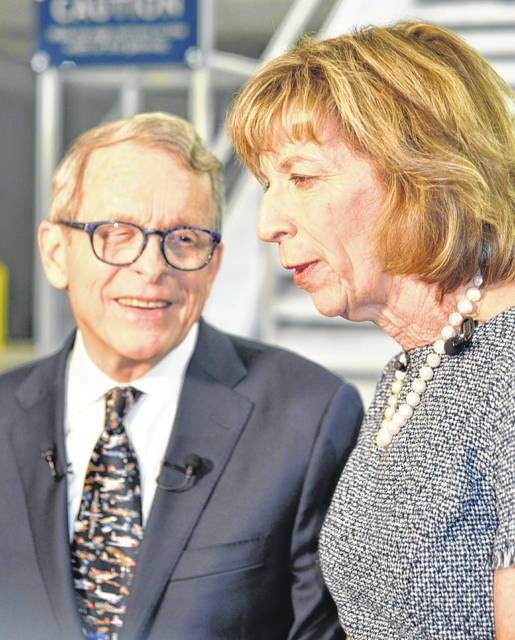 https://www.xeniagazette.com/wp-content/uploads/sites/32/2019/01/web1_DeWine-3_ne2019112224117597.jpgSubmitted photo Mike and Fran DeWine enjoy the first event of the Inaugural weekend — Celebration of Ohio’s Future Leaders and Innovators hosted by Lt. Governor Jon Husted. 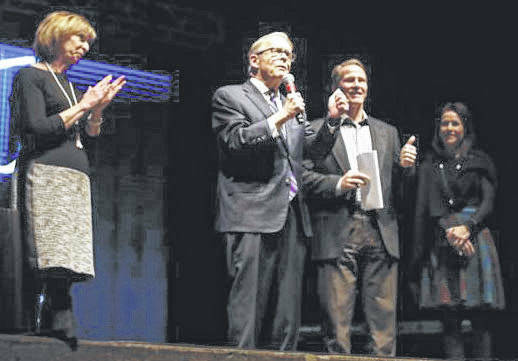 https://www.xeniagazette.com/wp-content/uploads/sites/32/2019/01/web1_DeWine-4_ne20191122241198.jpgSubmitted photo Fran DeWine, Mike DeWine, Jon Husted, and Tina Husted welcome a room of Ohio’s future leaders and innovators. https://www.xeniagazette.com/wp-content/uploads/sites/32/2019/01/web1_DSC_0027.jpgScott Halasz | Greene County News Mike DeWine speaks to the media during an inaugural event at the Science, Discovery and Family Fun event at the National Museum of the United States Air Force. https://www.xeniagazette.com/wp-content/uploads/sites/32/2019/01/web1_DSC_0040.jpgScott Halasz | Greene County News Fran DeWine answers a question as her husband, Mike, looks on. https://www.xeniagazette.com/wp-content/uploads/sites/32/2019/01/web1_DSC_0043.jpgScott Halasz | Greene County News Mike DeWine is interviewed by the Air Force. 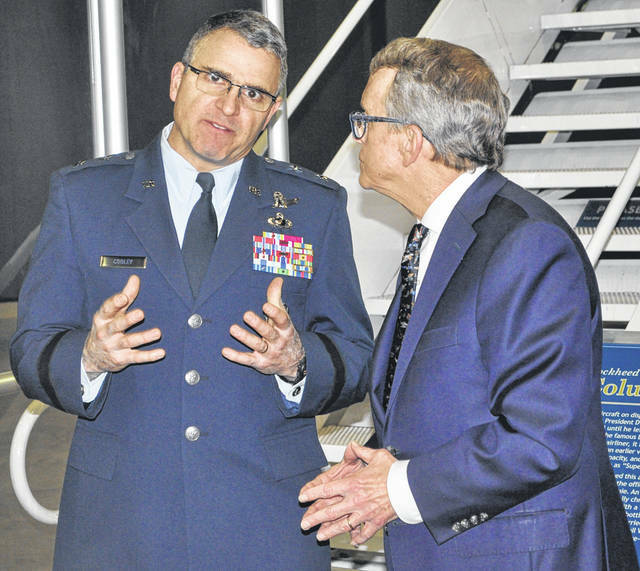 https://www.xeniagazette.com/wp-content/uploads/sites/32/2019/01/web1_DSC_0044.jpgScott Halasz | Greene County News Mike DeWine speaks with Maj. Gen. William T. Cooley, commander of the Air Force Research Laboratory at Wright-Patterson Air Force Base. https://www.xeniagazette.com/wp-content/uploads/sites/32/2019/01/web1_DSC_0045.jpgScott Halasz | Greene County News Mike and Fran DeWine receive a box of popcorn from a local scout. 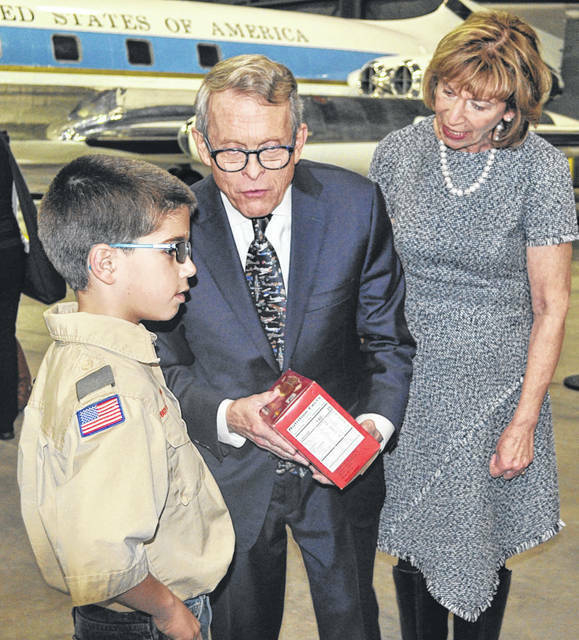 https://www.xeniagazette.com/wp-content/uploads/sites/32/2019/01/web1_DSC_0050.jpgScott Halasz | Greene County News Mike and Fran DeWine pass out airplane-shaped chocolates to those in attendance at the National Museum of the United States Air Force. 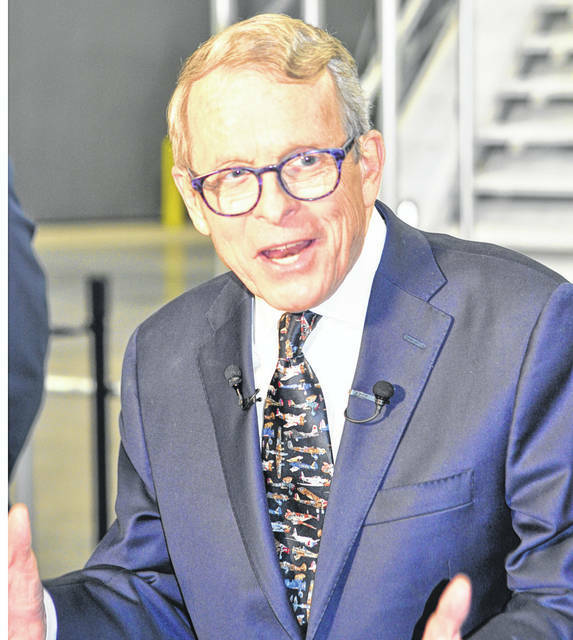 https://www.xeniagazette.com/wp-content/uploads/sites/32/2019/01/web1_DSC_0053.jpgScott Halasz | Greene County News Mike DeWine greets some attendees.